Shuck the oysters and remove from the shells, draining and reserving the liquid from inside the oysters. Wash the leeks and cut into thin slices. Peel and finely dice the onion. Heat a large cooking pot or saucepan. Add a drizzle of olive and then sweat the leeks with a pinch of salt. Add the liquid from the oysters and cook for 10 minutes. Add the chopped onion, the cockles, champagne and the water to a saucepan. Cover and cook over a high heat until the cockles have opened. Drain the juice and then reduce by half. Place a spoonful of leeks in each oyster shell and then place an oyster on top. 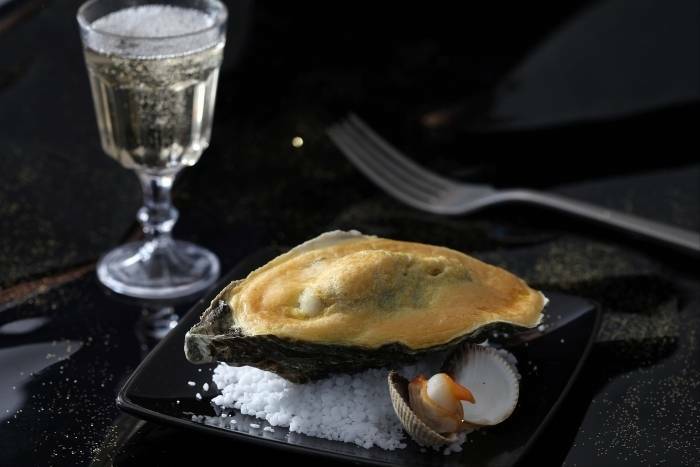 In a bowl over a bain-marie, beat the egg yolks with the shellfish and champagne reduction. Once the mixture starts to thicken, remove from the heat and whisk vigorously. Cover each oyster with the sabayon and then cook under the grill for 2 minutes. Serve immediately.